My full house renovation is finally done, and I absolutely love it. I hope you enjoy viewing my House Reno The Finale. To see before photos, please see my previous posts: House Reno Part One and House Reno Part Two. Before we get into the details, I want to thank Irwin Construction for making my house fabulous. I especially want to thank Kelley & Jeremy Irwin for their expertise on design and commitment to quality construction. They were fun to work with while being professional and attentive to my requirements and ideas. They saw my vision even better than I did. 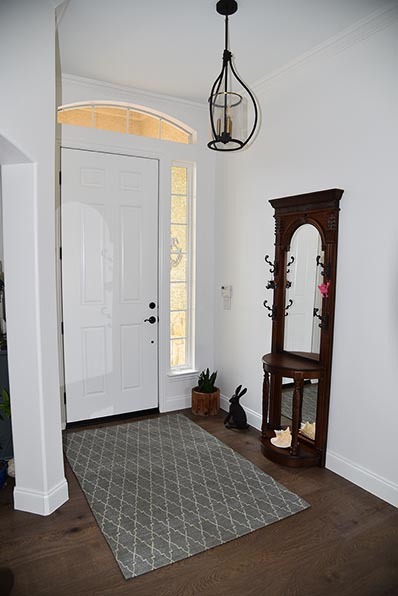 And, I want to give a big thank you to Jason and Kyle who work for Irwin Construction and spent many hours turning my house into the dream home it now is. First, let’s go over some of the common elements that were used throughout the whole house. 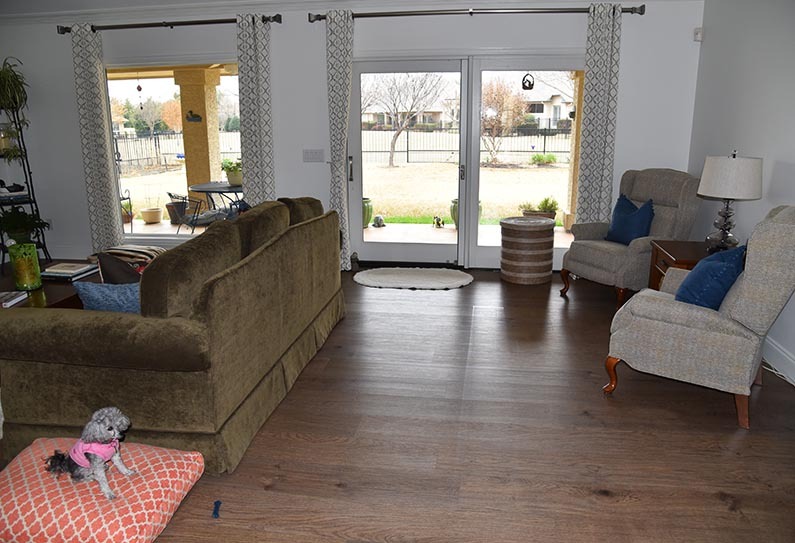 I had the existing tile and wood floors removed throughout the entire house including closets… literally every inch of floor throughout the entire house was removed. It was an ugly and dirty process. Even though they used a dustless method, it still was dirty, and the machines were very loud. I can’t imagine what it would have been like if they hadn’t used the dustless method. 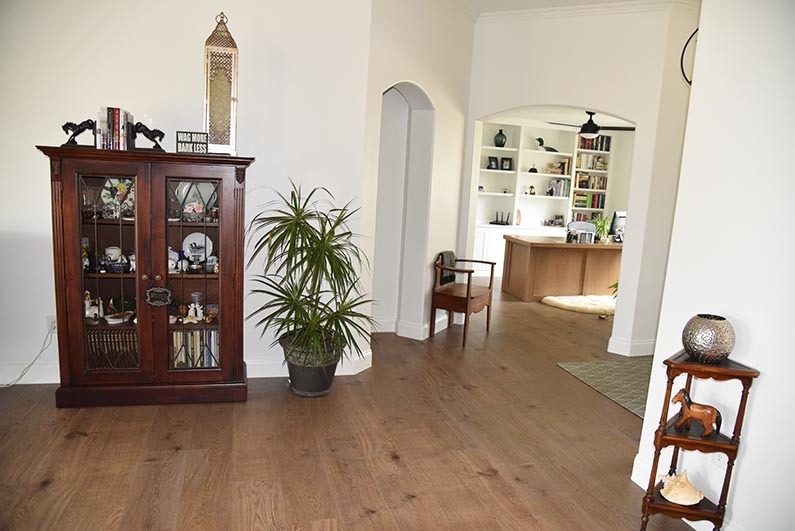 The new floor is luxury vinyl plank (LVP) by Karndean. We selected the Korlock Select in Smoked Butternut (RKP8107) for its rich mid-tone color and grain pattern. New base boards were installed around the edge of the floor eliminating the need for quarter round. The paint throughout the house is Sherwin-Williams. 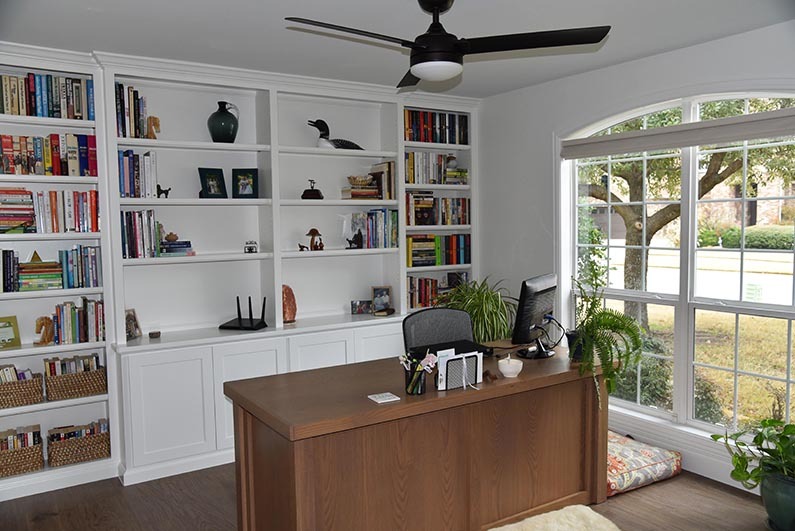 The walls were painted with Snowbound (SW7004) and the ceiling, trim, doors, and office built-ins with Extra White (SW 7006). 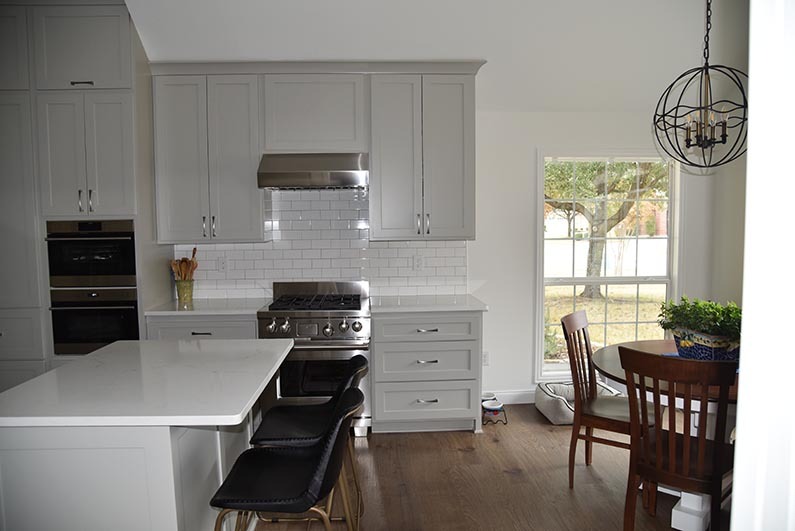 The kitchen, laundry room, and bathroom (master and guest) cabinets were painted with Mindful Gray (SW 7016). The house is so much brighter and open with the new paint colors. The quartz on the kitchen, laundry room, and bathroom countertops is Vicostone Misterio (BQ8815). The marble-look quartz has brown and gray veins. I really like the lighter countertops after having dark granite. 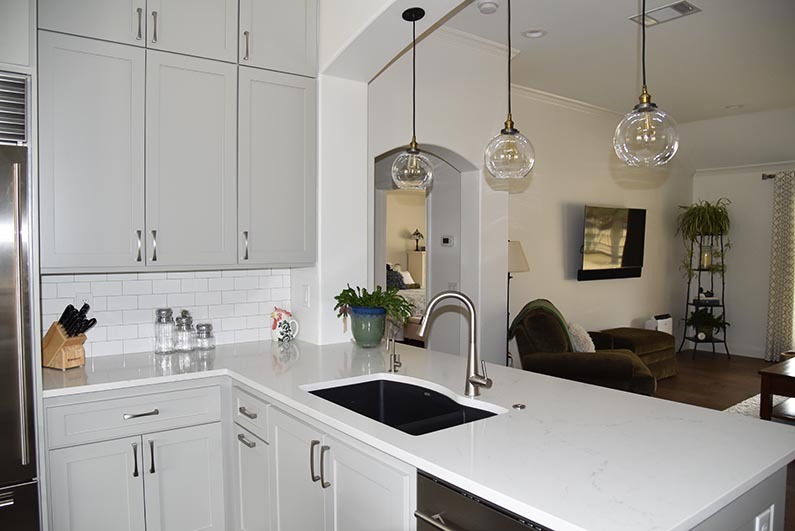 Like the paint colors, the new countertops help brighten the kitchen and bathrooms. 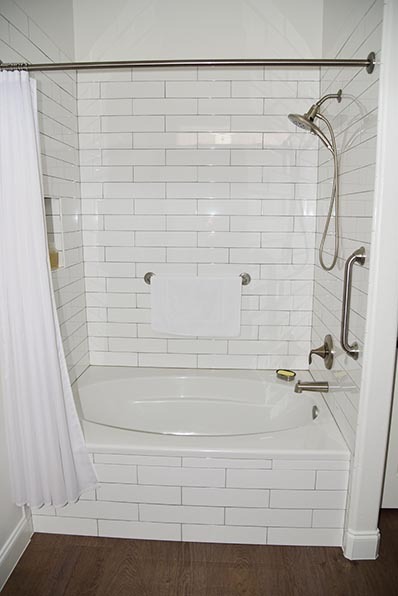 The tile used in the back splashes in the kitchen and laundry room, and the shower surrounds in the bathrooms is H-Line subway tile in Cotton Glossy from Arizona Tile. 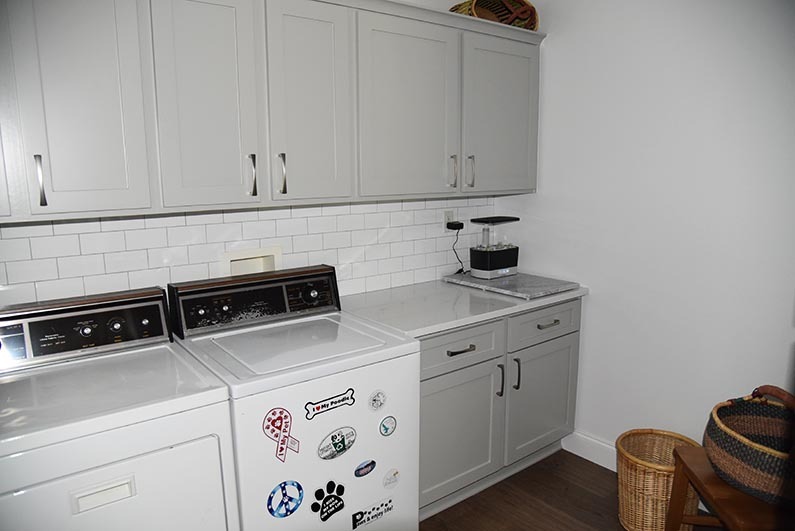 In the kitchen and laundry room, 3x6 inch tiles were installed in the classic brick lay pattern. On the shower surround and tub front in the master bathroom, 4x16 inch tiles were, also, installed in the brick lay pattern. 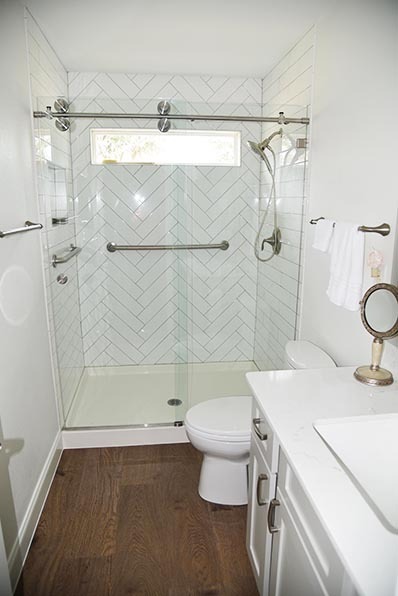 In the guest bathroom, we wanted to create a little more interest, so the 4x16 inch tiles were installed in a herringbone pattern on the back wall and brick lay on the sides. The ceiling fans are from Fanimation. We chose Xeno with lights for the office and guest bedroom and Xeno Wet without light for the living room and master bedroom all in dark bronze with dark walnut blades. The lights were updated throughout the house. My house had always been dark due to lack of lighting. In the living room, laundry room, master bedroom, and master closet, new LED recessed can lights were installed. New LED can lights replaced the existing can lights in the kitchen. 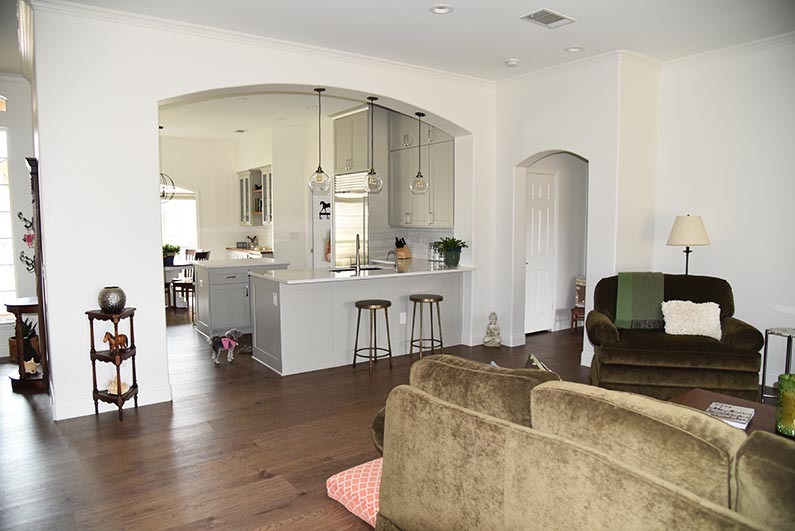 The kitchen, living room, and master bedroom lights are all on dimmer switches which allow for countless lighting experiences. 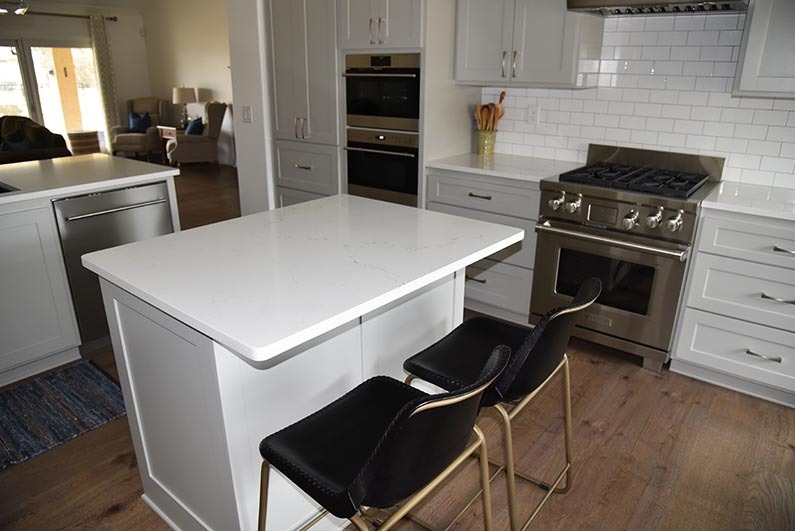 The cabinets in the kitchen were replaced entirely while the cabinets in the laundry room and both bathrooms were refaced with new doors and drawers. I updated the style to shaker and added new cabinet pulls, Berenson Aspire, in brushed nickel. Now that I’ve presented many of the common details throughout the whole house, let’s look at each room. The foyer is much lighter with the new paint and flooring. The transitional light fixture is the Fiona 3 Foyer Pendant light in the Olde Bronze finish with brass accents from Kichler. 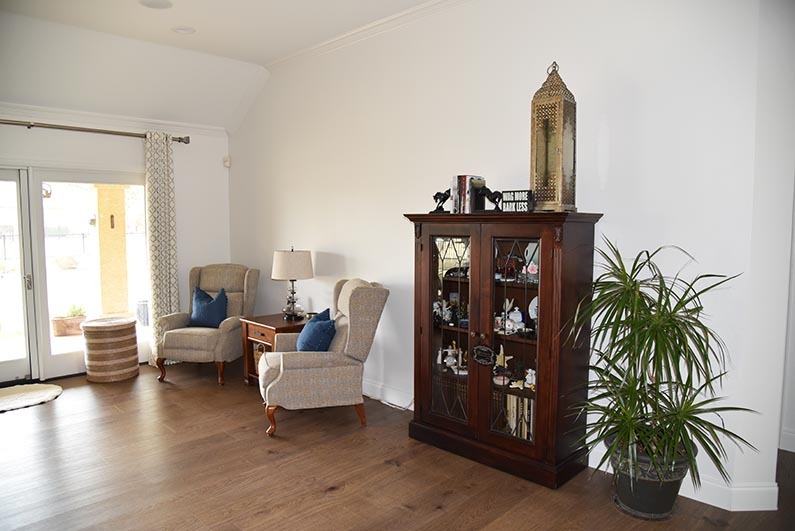 After coming through the front door, the living room is before you, and the office and guest rooms are off to the right. The office got new flooring, a fresh coat of paint, and a new ceiling fan and light. I spend a lot of time in the office and really enjoy the face lift. The guest bathroom has an updated look with the new tile, paint, flooring, countertop, cabinet pulls, refaced cabinets, and a new shower door. I kept the existing Moen brushed nickel faucet, towel and hand bars, and light fixture, but replaced the shower head with a Moen Magnetix Handshower. Another view of the guest bathroom. The guest bedroom got new flooring, paint, and ceiling fan. For all of my family and friends, it’s waiting for you to unpack your suitcase and stay a while. 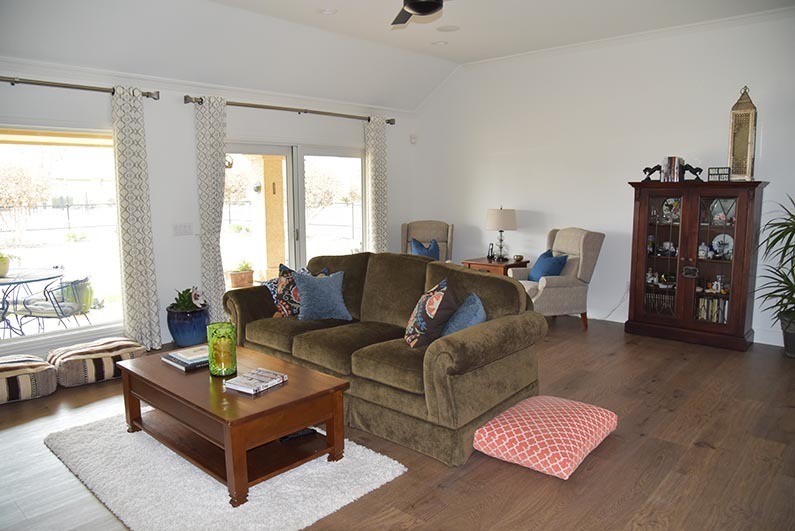 The living room was freshened up with new paint, flooring, ceiling fan, and recessed can lights. Izzie followed me around while I photographed the house hoping I would play with her. Just before Irwin Construction started the house renovation, I had Doctor Sound out to update the surround sound system. They installed a new Sony TV on the wall along with a new sound bar and Denon receiver. They, also, moved the ceiling speakers to better align with the repositioned furniture. 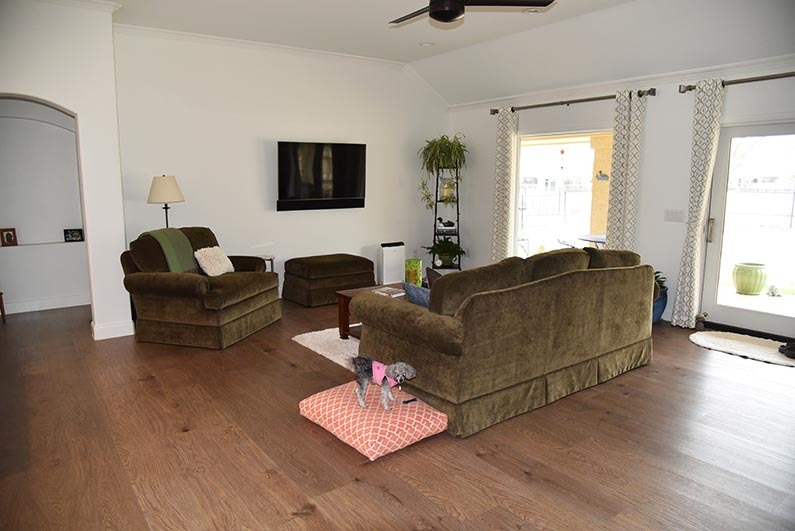 I still have to finish decorating the house and am looking for a new rug and wall art for the living room. From the living room, the opening to the kitchen is much more inviting. The bar was at bar height before and was cut down to counter height. It opens up the kitchen to the living room so much better. The counter stools are the Estrada bar stool from Pottery barn in an antique brass finish. The third bar stool was on back order at the time of the photo. Looks like Izzie still wants to play. Now let’s take a closer look at the kitchen which I absolutely love. I just wish I could cook better to do it justice. My new Sub-Zero and Wolf appliances are fabulous. I opted for the transitional style handles on all of the appliances except the range which has the pro style handel. The refrigerator is true counter depth and keeps produce fresh much longer. The new custom cabinets go all the way to the ceiling making the kitchen look bigger and providing more storage. However, I had to buy a new ladder to get to the upper, upper cabinets. The new kitchen sink is the Blanco Silgranit Diamond sink in Anthrocite. The large side of the sink is perfect for giving Izzie a bath. 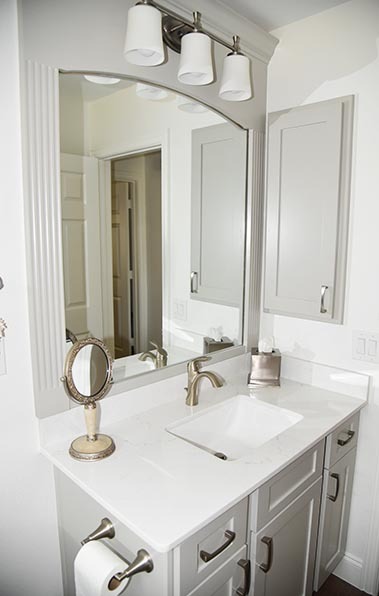 The main faucet is the Moen Sleek Pulldown faucet in stainless, and the smaller drinking water faucet has a brushed nickel finish and is from Mountain Plumbing. The little button on the countertop near the faucet turns on the garbage disposal when pushed which is very handy. The dishwasher is made by Asko which partners with Sub-Zero Wolf so the design features are the same. The pendent lights are the Restoration Hardware lights that were already there. I have so much fun and feel like a master chef when I cook on my new range. The closet like pantry was removed and replaced with new cabinets and drawers which, also, made room on the wall for the convection steam oven and microwave. The quiet and efficient range hood hovers above the range. And, the black leather composite Roadhouse counter stools are from CB2 and add another touch of brass. The cabinets were extended further down the wall and closer to the window. However, the area by the window is still Izzie’s little corner. 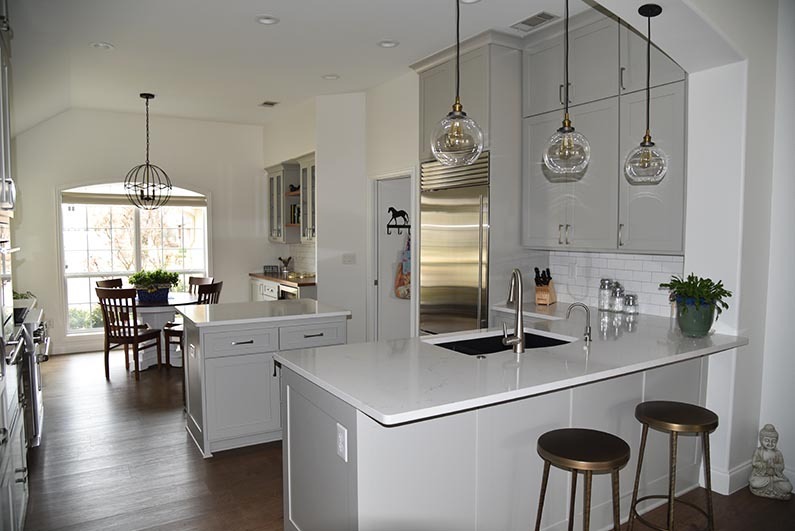 There are under counter lights throughout the kitchen, and all are on dimmers making for bright light when needed or more ambiance when desired. In the dining area, the wall was moved out and this cute ‘bar’ area was added. The garage lost a little space, but not enough to make a difference. 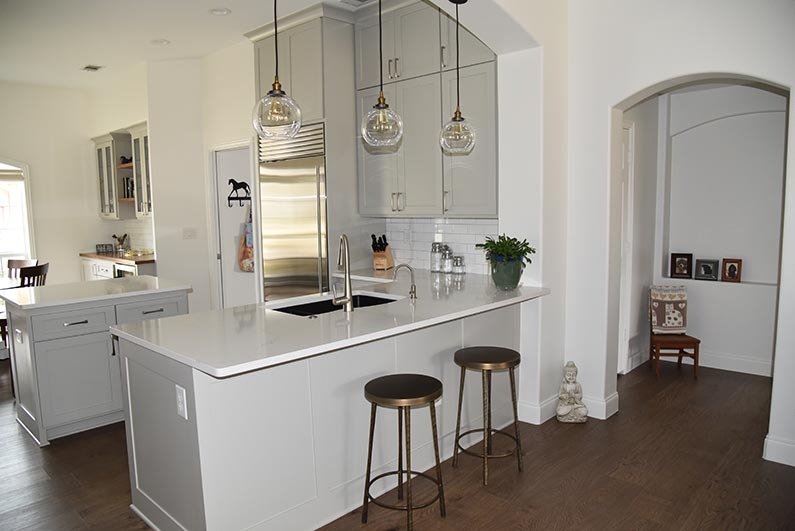 I like the wood stained counter top and shelves which give the kitchen a little bit of a modern farmhouse look. The wine refrigerator holds even my bigger Turley wine bottles. The transitional dining light is the Onduler Pendant in dark bronze and antique brass by Uttermost. 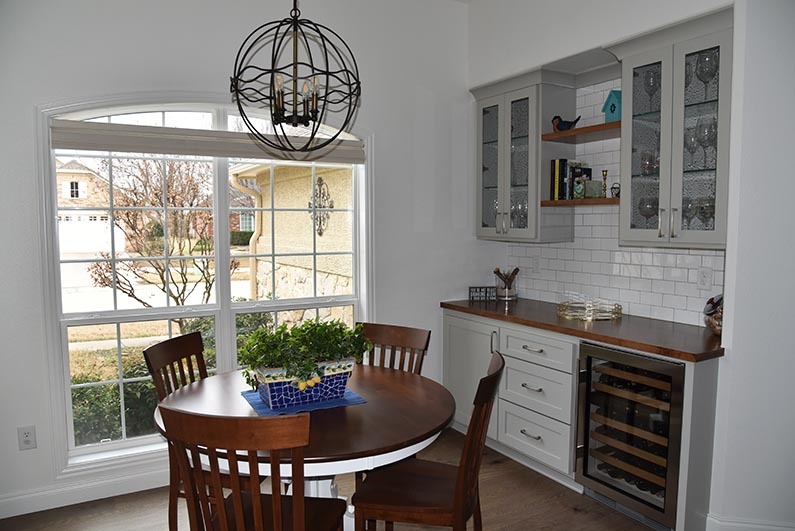 The rain glass cabinet doors reveal glass shelves in the lighted upper cabinets. 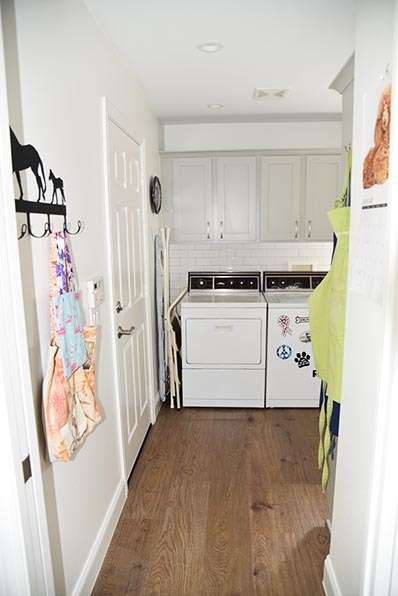 The laundry room connects the kitchen to the garage and was updated with new flooring, paint, tile, can lights, and refaced cabinets. My Kenmore washer and dryer may have seen better days, but they still run well. 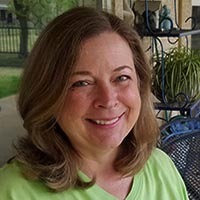 I got them when I moved to Texas 25 years ago. I feel like the laundry room is an extension of my kitchen. It has lots of extra storage for kitchen gadgets, pans, etc. There, also, is a large built-in cabinet on the right side of the room which isn’t in view in the photo. 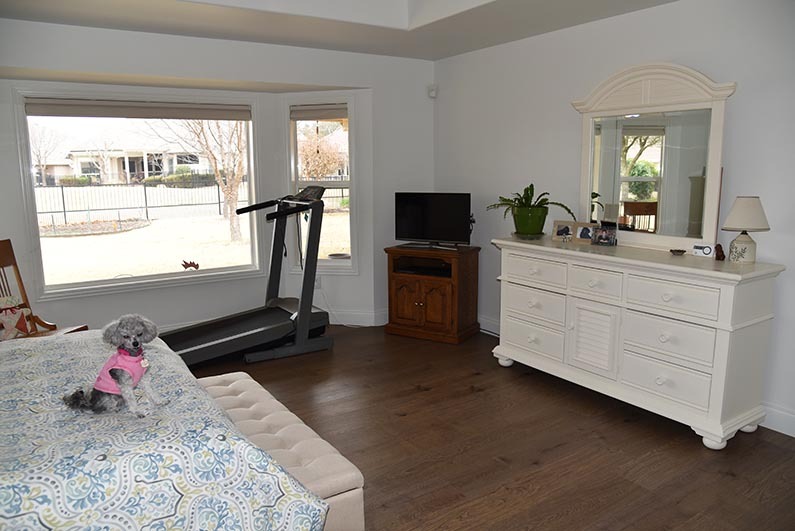 The little hallway to the right of the kitchen leads to the master bedroom. 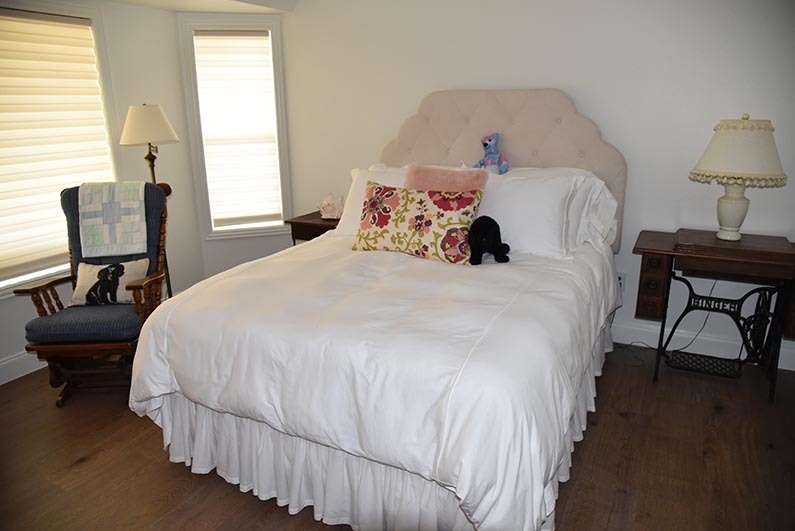 The master bedroom was updated with new flooring, paint, can lights, and ceiling fan. I want to find a new area rug and some wall art for my bedroom, too. As you can see, Izzie doesn’t want to miss out on anything. The treadmill is a bit of an eyesore, but I walk on it every day. Izzie gets on the bed and looks out the window while I watch HGTV or a Netflix series. Like the guest bathroom, the master bathroom was updated with new tile, paint, flooring, countertop, cabinet pulls, and refaced cabinets. Here, I, also, kept the existing Moen brushed nickel faucets, towel and hand bars, and light fixtures, and replaced the shower head with a Moen Magnetix Handshower. 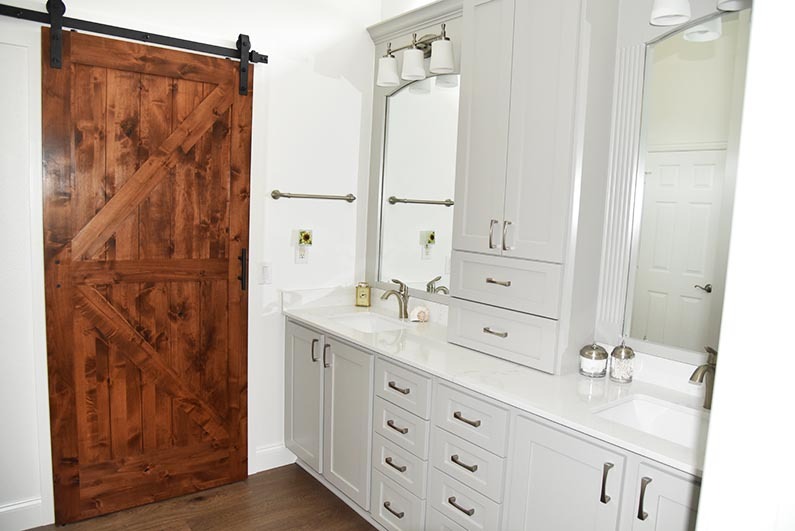 This gorgeous barn door leads to the master closet, and on the other side of the door is a full length mirror. That completes the tour of the House Reno The Finale. What do you think? Isn’t my house fantastic? I walk around in amazement that I have such a beautiful home. I like to show it off, so just give me a call and you’re welcome to come over and see it. If you live far away… ahem family, Izzie and I would love to have you visit us. Either way, we’ll have a glass of wine and enjoy my ‘new’ home together. Cheers!!! Wow ,, what a wonderful tour! !It is gorgeous,, you did a great job!!! Lots of storage ,, soo great of you to tell all the parts.. paint,, fans etc. It is very light and bright! !I got my living room rug at Home Goods and Costco has them often. Previous to the current rug in living room, I got the oriental looking one at Home Depot!!! Thankyou,, for your card and Izzie,s picture,, soo cute !! Hi Wendy. Thank you very much!!! I love my ‘new’ house. Let me know if you want to see it. I love showing it. Hi Mary. Thank you!!! I just got a new rug for my bedroom at Home Goods. It looks nice, and the price was great. Let me know if you want a tour. I’d love to show you my ‘new’ house. And Izzie would love to see you, too.